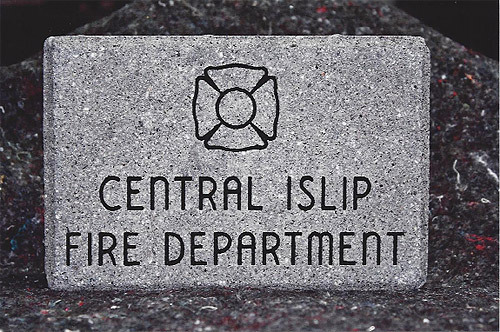 In 2009 a committee, consisting of members within the Central Islip Fire Department, was formed to design a memorial park as a dedication to all department members who have served and answered the last alarm since the department was founded over 100 years ago. This memorial will also be a dedication to 1st responders and members of our community who lost their lives tragically on September 11th 2001. The goal of the memorial is to provide a tranquil setting where family, friends and members of the department can gather to reflect on the deceased. We envision a place where memories will be shared, individuals can be honored and a meeting area for memorials to recognize those who have served. Because this will be a community gathering place we hope to enlist the support of a broad range of Central Islip residents and as many members, friends and family of the department as possible. The committee has selected 6X9 pavers that are available for purchase and can be engraved with the deceased name, rank, years of service etc. If you are interested in purchasing a paver, order forms are available to print. Please see the memorial brick tab within the Department Memorial link.